It’s another hot summer in Colorado, and while Estes Park is often up to 10 degrees cooler than the Front Range, July can still bring temperatures in the 90s. If you are signed up for a half or full day with your ATV rentals, it’s important for you to dress for the occasion and come prepared. The mixture of high altitude and the hot summer sun can quickly turn a great day into a disaster. Your clothing should be loose fitting, light colored, and made of cotton. Synthetics don’t breathe as well, and dark colors are going to absorb the light and the heat along with it. Your ATV adventure is going to be outdoors, so tank tops or t-shirts and shorts are generally the way to go. Water is absolutely essential to keep you hydrated and cool. If you are going to be out all day, we recommend storing a couple of filled water bottles in the freezer the night before. This way, they’ll stay cooler longer and you’ll have a cold, refreshing drink even towards the afternoon. Make sure you are drinking your water frequently. High-protein snacks are the way to go. Think foods such as nuts, dried fruits, beef jerky, etc. We also recommend eating a full meal before your trip, because addressing your hunger and keeping it under control will ensure you are energized for a day of adventure. Sports drinks are a great way to maintain your level of electrolytes and combat dehydration. However, watch out for sports drinks with high sugar content, as this will cause you to crash and may actually dehydrate you. Remember, sports drinks are never a substitute for water, so pack both! We want you to have fun, but we also want you to stay healthy, cool, and happy. These are the things to avoid to ensure you have the best time on your ATV trip. Coffee: Coffee and other high-caffeine drinks are known to dehydrate you. If you can’t go without your morning brew, remember you will need to drink more water to compensate. Alcohol: While drinking alcohol before or on your trip is prohibited, we also recommend avoiding it the night before, as it will dehydrate you. Sugar: Snacks with high levels of sugar and small levels of protein will exacerbate the symptoms of heatstroke and dehydration. Remember where the sugar content is coming from, however. Dried fruits are going to have a higher sugar content, but that is in part due to the levels of natural sugar in the fruit itself. Dried mangoes, bananas, apples, etc. are much better for you to snack on than any processed foods. 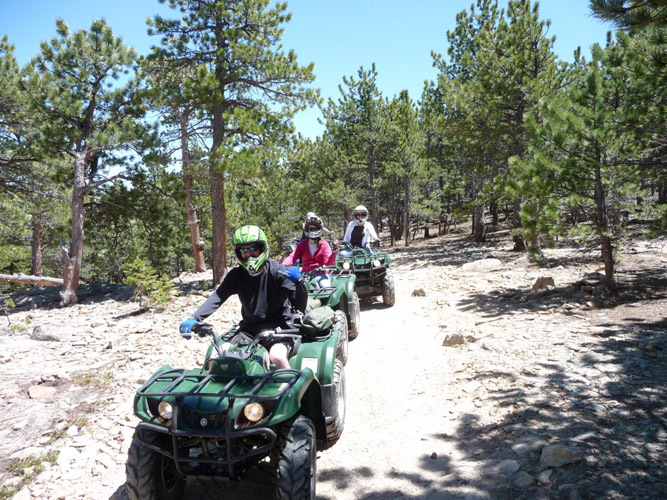 When it comes to your unguided ATV tour, you are on your own adventure. Make it memorable by staying safe and taking care of your body.